10. MARILA Sw., Prodr. 84. 1788. Shrubs or trees; latex white, brown, yellow, or clear. Leaves opposite, without strong intersecondary veins, tertiary veins parallel and generally perpendicular to secondary veins, punctate. Inflorescences racemose or paniculate, axillary or rarely terminal; pedicels with paired basal bracteoles. Flowers bisexual. Sepals 4 or 5, often quincuncial, in 2 usually dimorphic series; petals 4 or 5. Stamens numerous; filaments free; anthers with spherical or cupulate glands. Ovary 3-5-locular, with numerous ovules per carpel; style single, short; stigmas ± expanded. Fruit a septicidal capsule, often narrow and elongate; valves often twisting to reveal the papery central column. Seeds numerous, minute, often comose at both ends; embryo with small cotyledons. Neotropics from Mexico and the Antilles to Bolivia; ca. 20 species, 2 in Venezuela, 1 of these in the flora area. 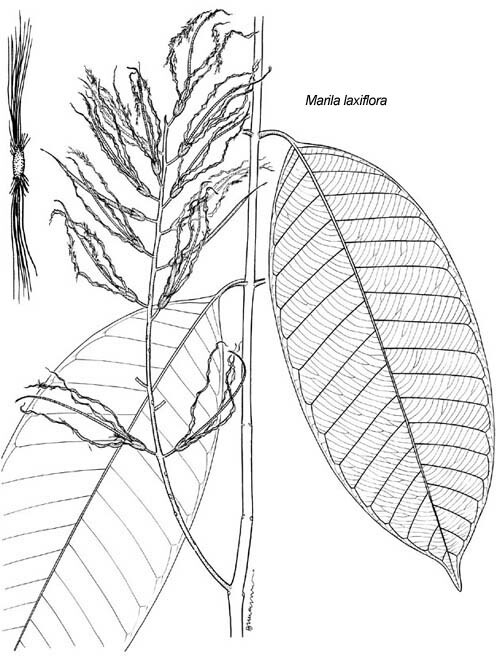 Marila laxiflora Rusby, Mem. Torrey Bot. Club 6: 9. 1896. Tree 8-12 m tall. Evergreen lowland, riparian, and lower montane forests, 200-400 m; Bolívar (10 km southeast of Salto Pará), Amazonas (Sierra de la Neblina). Zulia; Mexico to Bolivia. Fig. 218.